For years I had a desire and a calling I did not understand and so I followed a traditional path of University degree, political internship and finally the much coveted stable pensioned Government Job. Luckily, my calling didn't give up on me and go into hiding, instead it wiggled its way into my life in the form of yoga, crystals, essential oils and teachers who opened my eyes to the magic around us. Four years ago I had the opportunity to reinvent my life and took the leap to fully embrace my calling and began my reawakening and training as a Healer and Priestess. My work now is to play between the veils, the seen and the unseen, I am a bridge between the manifest and the unmanifest. The world of energy is fascinating, exciting, elegant, wise and fun. I am a certified Eden Energy Medicine Practitioner, Yoga Teacher Trainer and a Priestess-initiate of the 13 Moon Mystery School. I offer clients a holistic and spiritual approach to healing and wellness with a focus on shifting sub-conscious belief patterns. I call my unique and empowering approach Sacred Alignment. I am also mother to two little red heads who always keep me on my toes! 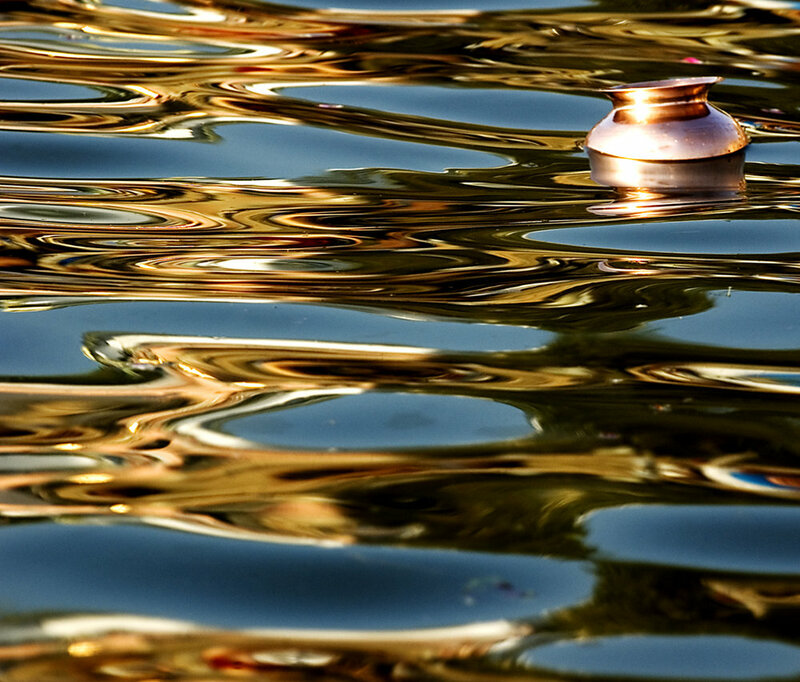 As morning dawns this puja urn floats lazily among the reflections in the Ganges River. For many in Varanasi, each day begins with morning puja (prayer) followed by a bath in the sacred river. The Ganges is truly a sacred entity, revered as a goddess whose purity cleanses the sins of the faithful and aids the dead on their path toward heaven. Hindu mythology deems Varanasi a holy city that liberates the soul from human body to divinity. I will always remember the energy I felt swirling around me in Varanasi.